New Optimum AMLA Relaxer Review - The Good, the Bad, the Burning! It had been almost 3 months since I relaxed my hair. In a way, I was trying to stretch my relaxer a bit more than I usually do. I had burnt the front of my head with a relaxer that I think may have been old, so I wanted to give my scalp a break. 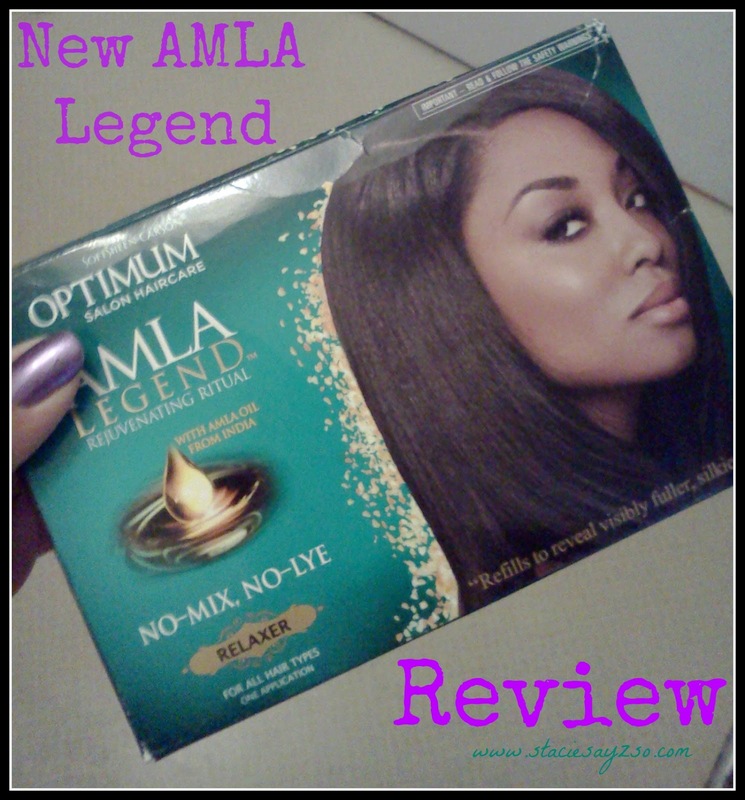 I was in desperate need for s touch up, when I cam across the new Optimum Amla Legend Relaxer Kit from Softsheen Carson. I found it on sale at Sally's so decided to pick it up. As you can tell, I'm crazy about the scent of the new AMLA Legend products, so that was a huge plus for me. Who doesn't want their hair to smell good? But I have to be honest. This relaxer burnt me good! I don't know if my scalp is changing as I'm now older, but I'm definitely starting to notice my scalp being more sensitive to relaxers. I will say that I left out a very important part of my at-home relaxer process. Vaseline! I usually always use it, but this kit provided a scalp protectant for me. Obviously, it didn't work! Relaxers usually stink and this had a very pleasant smell so I guess I'm sold, well..sorta. Since my head was on fire, I can't give it the best recommendation, though I will try it again with some type of petroleum jelly on my scalp instead. I will update you all in another three months or so when that happens. That's odd to have irritation with a no lye. It was always my understanding that every relaxer really does have lye in it. I'm not sure why they say no lye. It's a lie lol. Oh no, sorry you had a bad experience with how it felt! You were a trooper letting it sit in for as long as you did. You are like me, willing to give it another try. Yeah, I am a trooper alright. They should pay me to try it again lol. I know, I know. I did the natural thing in my teens and hated it! I really like it relaxed and yeah, I should take a break from it all. I think you should make vlogs. You'd be good at it. Besides, then I can hear what you sound like lol. I left it on two five minutes. It took portions of my hair out even though I followed directions and used the scalp protectant. I know other people who lost hair with this perm as well. That's awful! I hope it grows back soon. Yeah, I've used regular Optimum relaxers and they didn't burn as much. I ran across this relaxer at walgreens..in my tow. It is an hour drive to a hair store. But i am sorry yall had a bad experience. I love it and it has my hair alot healthier and even looks more healthier. My hair dresser said she is very shocked to see my looking healthy since i have not seen her in 2 months. I'm glad you got really good results from it. When something works for you, you should stick with it. This is the worst relaxer I have ever used! My hair is considerably thick and strong and can take its fair share of "punishment", but this relaxer has cause immediate, severe, continuous breakage and shedding in the back portion of my hair. Not to mention it torched my scalp and left my hair dry and stiff. They should pull this disgraceful attempt of a relaxer off the shelves! I used this relaxer and it is the worst thing I have ever done to my head. Thank God for thick hair I would be considerably bald as of now, so much of my hair came out it was unbelievable. I agree they need to pull this off the shelves, my hold head was burnt before I could finish the relaxer, my hair is now stiff, dry, and the back it broke off and burnt. So embarrassing, I have never experienced such a tragedy in my life concerning my hair. Some people probably scratch their heads BEFORE they relax it, and I've always been told not to scratch before a relaxer because it makes it worse. I am looking to use this on my hair but everyone saying that it's a bad product is making me not want to try it (and I am very open minded). This burned my scalp SO BAD! My hair came out around the edges. Smh. I hate this product. It burned immediately. I couldn't keep it in long enough to smooth it let alone long enough for it to actually straighten my hair. DO NOT BUY!! I just used it...no burning and my hair looks and feels great! I've used it about 3 times already and my hair dresser was impressed how easy good my hair reacts to heat and how it shines! This is the worst relaxer i have ever done to my hair. the burning was bearable but irritating and it took no time for the burning to start. also it burned me so bad in the back that my hair fell out. but good thing i have a short cut, i can say that i did get a new idea for my short hair being that my hair was brunt. i wont use it again!! I use this relaxer and it never done anything to me. I use it because I use the Amla oil from India. I used the amla oil as the scalp protection though.